Mostly initiatives are restricted to specific projects rather than being organisation wide, although in manufacturing the split is 50:50. The average organisation has eight IoT-related projects underway, even the sceptics admit to a couple. 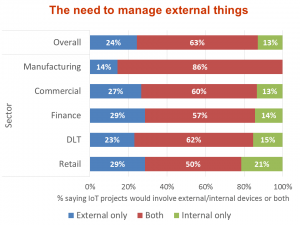 Most expect these projects will have need for at least some external device interaction, just 13% said it would be internal only, whilst 24% said it be all external, the remaining 63% said it would be mixed (see figure). For a manufacturer, external connectivity may be with devices purchased by business customers or consumers (the latter often connected via home routers). A transport company may have ticketing machines in third party locations, whilst a retailer may communicate with apps on shoppers’ smartphones. All such initiatives have the promise of making business processes more efficient and improving customer engagement. However, there are also challenges to be overcome; dealing with large numbers of devices, huge data volumes and security headaches. Quocirca’s Reference Architecture for the IoE proposes a way of addressing these problems in a practical, affordable and scalable fashion. It involves the use of aggregators which are essentially hubs or gateways that connect with and manage groups of devices. Aggregators may be purpose built for specific applications or be generic network devices that takes on the role (for example home routers). Aggregators overcome the need for every device to have a unique IP address. Each device can have an IP address the aggregator understands and the aggregator can use network address translation (NAT), a long-established technology, to broker communications between a given device and the rest of the world. The aggregator can also filter incoming requests and content to ensure it is secure. This precludes the need for on-device security, which in many cases, which can be expensive or impractical if the device has limited processing power, as may be the case with low cost and/or legacy things (a further blog post will discuss this in more detail). Finally, aggregators can analyse and filter the data generated by the devices they manage. Each aggregator can be intelligent enough to recognise exceptions in a data flow that an individual device cannot. For example, a surveillance camera can record all it sees and stream data to an aggregator which can analyse the flow for unusual activity and, when necessary, alert security staff. Unexceptional data can be discarded, after a period of time, without ever moving beyond the aggregator. An aggregator in a supermarket aisle can send information cached locally to shoppers scanning QR-codes without the need to constantly refer to a central database and only do so when a more customised response is needed. There are already quite a few aggregator-like offerings on the market. First, there are smart hardware gateways from companies like MultiTech, Eurotech, Advantech and Dell. Red Hat, an open source software distributor, says its middleware is often being adapted to work as IoT gateways and the necessary capabilities are being built into IoT cloud platforms such as Microsoft’s Azure IoT suite, AWS IoT and GE’s Predix. Some security vendors with a focus on the IoT, such as ForeScout, which sponsored another 2016 Quocirca report, are also adapting their technology to act as IoT gateways (see European Perceptions, Preparedness and Strategies for IoT Security). Much of the value of the IoT will come from the way it improves a given organisation’s ability to interact with the outside world. However, that will only be practical if a scalable, intelligent approach to IoT projects is taken from the outset.